The 2015 cookbook challenge is still in full swing! Last week, I shared the Braised Winter Cabbage and Potatoes from Thug Kitchen, and this week I’m coming at you with another cabbage recipe in the form of Stuffed Cabbage Rolls from Practical Paleo . While I don’t follow a strict paleo diet, I really love a lot of the recipes in the Practical Paleo cookbook. The book uses a lot of different meats (like bison!) and offers different meal plans depending on your activity level/dietary restrictions. I’ve made a couple of things from the book now, and these stuffed cabbage rolls were absolutely delicious. The original recipe calls for ground beef, but the Englishman and I decided to lighten it up a bit and used wild boar for the meat. We also omitted the cranberry sauce, but followed the rest of the recipe to a T.
As someone who used to HATE cabbage, I really enjoyed the Stuffed Cabbage Rolls from Practical Paleo. I will say this was a more time-consuming recipe than I anticipated (probably because it was our first time doing it) and our rolls kind of fell apart in the dutch oven, but it was still quite tasty. We served this dish with a side of roast potatoes, but it would also be quite nice over rice or even pasta. The sky is the limit on this one! Steam your cabbage until it is nice and tender. We technically do not have a steamer, so we made do with what we had. While your cabbage is steaming, shred your cauliflower into small pieces. Saute in a skillet over low head with olive oil, your shallots, and salt and pepper. Place your meat in a bowl and add the cauliflower mixture. Mix until everything is well blended and set aside. 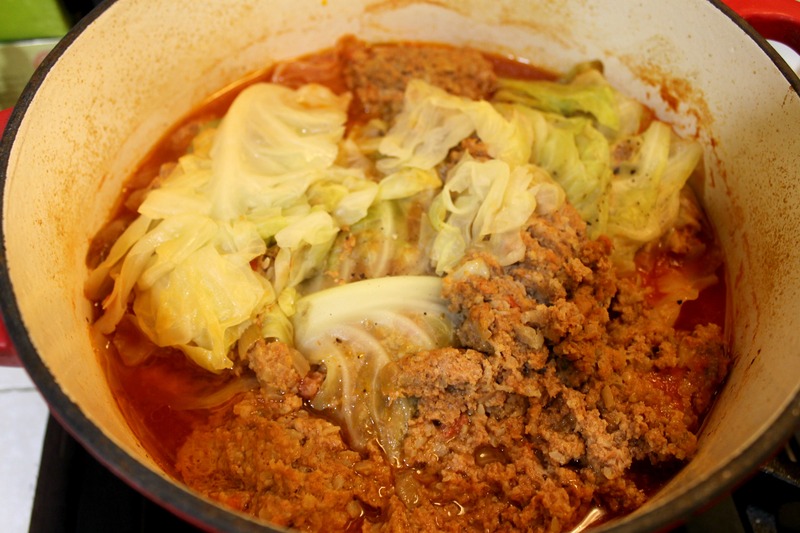 Remove your steamed cabbage and peel off layers for filling. Gently scoop your meat into the cabbage layers and roll tightly (like a burrito). Add your canned tomatoes to your dutch oven (or other deep cooking pot) and gently place your rolls on top of the sauce. Cover and bake for 45-50 minutes. Remove from the oven and enjoy your delicious rolls! This entry was posted in Best Of, Cooking, Dinner, Gluten-Free, Good Eats, Paleo and tagged cookbook challenge on January 16, 2015 by allie@sweetpotatobites. I absolutely LOVE cooked cabbage. It’s my favorite part of stew. I’m going to have to peek through this cookbook next time I’m at your place. I’ve heard so many good things! And lastly, where did you find wild boar? sprouts has wild boar! it’s in the frozen meat section 🙂 and the cabbage dish is delicious…I want to try it over rice next time!